All India Institute of Medical Science, Jodhpur Jobs Recruitment Notification 2019. AIIMS Jodhpur inviting applications for the positions of Faculty.Interested and Eligible candidates can apply for the positions. A postgraduate qualification e.g. MD/ MS.
1-Master’s degree in concerned specialty. 2-A doctorate degree of a recognized university. 1. A postgraduate qualification e.g. MD/ MS.
2. D.M. in respective discipline/ subject for medical super-specialties and M.Ch. in respective discipline. Experience:- Eight years of teaching and/or research experience. Experience: Six years of teaching and/or research experience. 1. A post graduate qualification e.g. MD/MS. 2. D.M. in the respective discipline/subject for medical super specialties and M.Ch. in the respective discipline/subject. A postgraduate qualification e.g. MD/MS. 1. A postgraduate qualification e.g. MD/MS. Experience: Three years of teaching and/or research experience. 1) Gen/ OBC1) General/OBC Candidates - Rs.3,000/- (Rupees Three Thousand Only). 4) The candidate pays prescribed application fees through Online Mode Only via payment gateway of AIIMS, Jodhpur. Transaction/ Processing fee, if any, as applicable will be payable to the bank by the candidate. 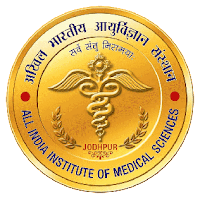 Look around for “AIIMS Jodhpur Recruitment 2019 for Faculty Posts“.